The Bethany Beach Boardwalk Arts Festival is a prized September tradition. 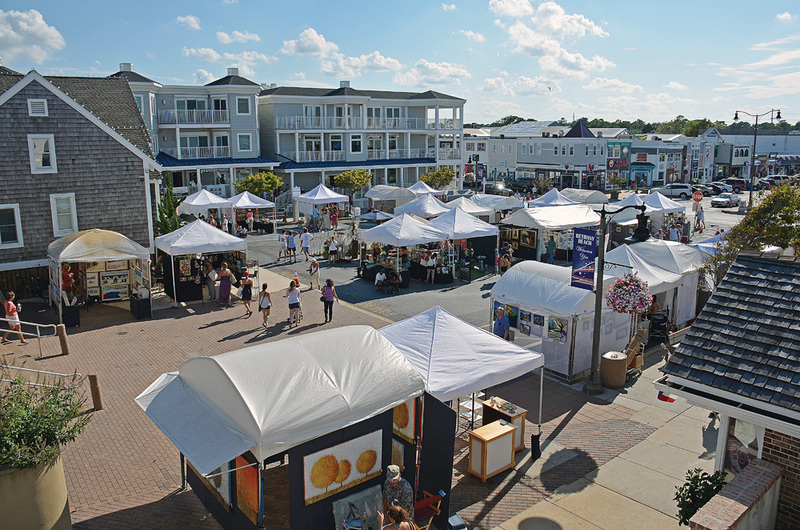 The Bethany Beach Boardwalk Arts Festival has established itself as a popular event, bringing artists and visitors to the town for the past 40 years, as an unofficial kickoff for the extended season. More than 100 fine artists will line the boardwalk again this year, with items ranging from paintings to jewelry, and unique pieces in a wide variety of materials, including glass, metal, fiber, clay and wood. This year, the fun of the festival itself, set for Saturday, Sept. 8, will continue into Sunday with a special event featuring one of the area’s most recognizable artists. The Meet the Artist Brunch, featuring John Donato and sponsored by Beebe Healthcare and Southern Delaware Tourism, will be held at Good Earth Market on Sunday, Sept. 9, from 10 a.m. to 1 p.m.
Donato, whose murals can be seen in local schools and municipal buildings, often brings the community along for the ride as he depicts iconic scenes from the area’s past and present. At Sunday’s event, he’ll even be offering the shirt off his back. Well… the overalls off his back, actually — and anyone who has seen him at work knows how special they are. The Meet the Artist Brunch will have two components for arts patrons to choose from. From 10 a.m. to 11 a.m., holders of VIP tickets to the brunch are invited to a “Sip & Share” with Donato, where they can learn more about him and his art while sipping mimosas and painting their own creations. The event will be held under a tent at Good Earth Market in Ocean View, next to the pond on the market’s landscaped property. Only 25 tickets will be available for that part of the event, at a cost of $125 each. From 11 a.m. to 1 p.m., Donato will again be the focus for the Garden Brunch portion of the event. While learning about Donato and his art, guests may take advantage of a cash bar while choosing brunch goodies from a special menu prepared by Good Earth chef Nino Mancari. The market’s gardens will be filled with unique works up for auction — including Donato’s overalls. Tickets for the Garden Brunch cost $50 per person or $95 per couple. All proceeds from the Meet the Artist and Sip & Share events will benefit art programs at five local elementary and middle schools. While the Boardwalk Arts Festival always brings artists and artisans from near and far, local art programs continue to be central to its purpose. A silent auction of pieces donated by participating artists will be held at the bandstand — literally front and center for the event — from 10 a.m. to 2 p.m. during the festival. Proceeds from the auction also benefit five art programs at five local elementary and middle schools. Works by local student artists will also be on display, and festival-goers can vote on their favorite one to help choose scholarship winners. Metered parking is available in Bethany Beach during the festival, and the town’s trolley will be operating on its normal summer schedule. St. Ann’s Catholic Church, a 10-minute walk from the boardwalk, has also offered its parking lot for visitors’ use during the festival. Boardwalk Arts Festival hours will be 10 a.m. to 5 p.m. Organizers still need volunteers to help with set-up, silent auction and parking duties. To check on what help is needed, go to https://www.signupgenius.com/go/60b0b4ca9ab22a1fc1-40th. To purchase tickets for the Meet the Artist Brunch events, go to business.bethany-fenwick.org/events/details/meet-the-artist-brunch-featuring-john-donato-12441.